"The challenges that Randa faced are the same problems that many businesses face; accurately identifying where stuff is and how much they have. Utilizing RFID and our PortalTrack software we were able to bring real-time visibility to the Randa Fulfillment Center. The results enabled Randa to easily and accurately identify inventory locations and counts; which in turn lowered labor and operating costs, increased customer satisfaction and enabled real-time decision making.” Brett Wilkerson, RFID Business Development, MSM Solutions. "We have replicated this same model with other customers and see a continual climb in the number of requests for similar applications. As RFID becomes more and more mainstream, we will see many more customers adopt this approach and leverage the power of RFID to Identify – Track- Count and Manage inventory," Brett Wilkerson, RFID Business Development, MSM Solutions. Founded in 1910, Randa is the world's largest men's accessories company, spans 11 countries, with a portfolio of 50+ brands and 100+ years of experience. From sketch to scale, across four extraordinary product divisions, Randa produces exceptional products and services worldwide, delighting customers. With a current product mix that includes neckwear, jewelry, belts, furnishings, wallets, seasonal accessories, luggage, and travel; Randa has proven to be an industry leader in trends, innovation, design and consumer insights. 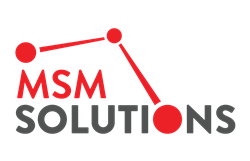 MSM Solutions has been providing exceptional service and innovative applications for more than thirty years. As the leading integrator of barcode and RFID products, MSM Solutions matches the best technology to customers' business goals. MSM Solutions PortalTrack Software is a customizable software solution trusted by the world’s leading brands. PortalTrack identifies, counts, tracks and manages millions of objects every day. Founded in 1981, MSM Solutions is headquartered in Memphis, Tennessee, and services customers around the world. Visit http://www.msmsolutions.com to learn more.